Habits are patterns of behavior which emerge over time. Some dental habits are great, like regular brushing, flossing, and using an oral irrigator. But, some habits can damage your enamel, teeth, or gums and should be avoided. Here we take a look at a few of them. If you’re fortunate enough to be an ex-smoker, take a moment to celebrate. Smoking is a difficult habit to overcome, but not impossible. Once you quit, you lower your risk for several diseases of the mouth and jaw. You can do it! Get help. Chewing on ice is a comforting habit, but can endanger your teeth and gums. Ice can crack or chip an otherwise healthy tooth and harm enamel. If it’s more than a bad habit, like a craving, the patient should have their iron checked, as some people with iron deficiencies report a compulsion to chew ice. How can something which is good for you cause a problem? 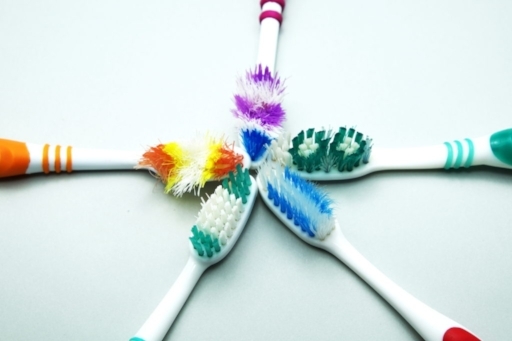 Replace your toothbrush every 3-4 months, or more often if it becomes frayed. First of all, because if you brush two or more times a day (and we know you do! ), all of that cleaning means all of your tooth surfaces get a lot of scrubbing! But, if you brush too hard, it can damage your enamel, and, even worse, damage your gum tissue, which is delicate even in a healthy mouth. If your newish toothbrush has worn or frayed bristles, either someone has been using it to clean the sink, or you’re brushing too hard. Just brush softly and spend more time. It’s easy to get into the habit of clenching a pencil in your mouth, chewing on a popsicle stick after you’ve enjoyed the treat, or holding a few hairpins in your teeth when you’re doing your hair. Even chewing on bones and biting your nails take their toll on your pearly whites. The effect might not be as dramatic as a chipped tooth. The effect can be more subtle, in the form of wear and tear which can eventually lead to noticeable damage.Tapping things against your teeth falls under this category, as well. Opening packages or wrappers, tearing off a piece of tape, snapping off a loose thread from a sewing project or article of clothing are all means to damage your teeth. The solution is to keep as many pairs of scissors as you need in locations you find yourself doing this until you unlearn the habit. Ultimately, owning many pairs of scissors is a better option than having even one filling or crown. Resting your chin in one hand, in the palm or on the knuckles is a common habit among people who work long hours at a desk. Try it now and see what happens. As you probably noticed, it forces your teeth to take the weight of your whole head! Grinding or gritting your teeth is very similar. If you’re a ‘night grinder,' you can get a mouth guard which will help protect your teeth. However, if you grit your teeth in the daytime, that’s going to be a little harder to fix. You’re going to have to make the decision not to indulge in it. There may be situations (or people!) you’ll have to avoid until you get the hang of it. The most important thing is to be aware of what is happening when you grind your teeth. You may also notice it happens more often when you’re tired or under a lot of stress. If you get a sore jaw sometimes, or a headache at your temples, these are other signs you may be grinding. We hope we have given you some thought for habits you may want to avoid to protect your teeth. Unlearning a bad dental habit is taking a series of baby steps on a regular basis. A little progress is still progress! If you have any questions or concerns, we are available. If you need a gentle, caring dental team, please call our office at (623) 362-2550. We’ll give you the very best care we can!